Taj Dearob Pharma is an Ghana owned and operated International pharmaceutical company. We have evolved to become a leading pharmaceutical wholesaler and manufacturer of generic medicines, branded medicines, Active Pharmaceutical Ingredients (API’s) as well as Contract Manufacturing and Pharma Technology services. We also specialise in an extensive Oncology range with over forty different anti-cancer drugs and dosages in our portfolio. Our vast selection of generic medicines extends to a portfolio of over 4,500 products ranging from CNS, cardiovascular and tuberculosis to mention but a few. Ms Priyanka Singh – Ms. Singh was appointed Director of Taj Dearob in February 2014. Ms Singh also holds Directorships in the Taj Pharma Group which includes Taj Pharmaceuticals Ltd, Taj Energy PVT. Ltd, Taj Life Sciences PVT. Ltd and Taj Pharma Srilanka Ltd.
We are always interested to meet innovative people who want to work with us to deliver our vision and who will strive to represent Taj Dearob in the pharma market today. Corporate governance is crucial to the success of any company today and Taj Dearob understands how good corporate governance enables a company to manage its business efficiently and in turn, provide a professional service to its customers. 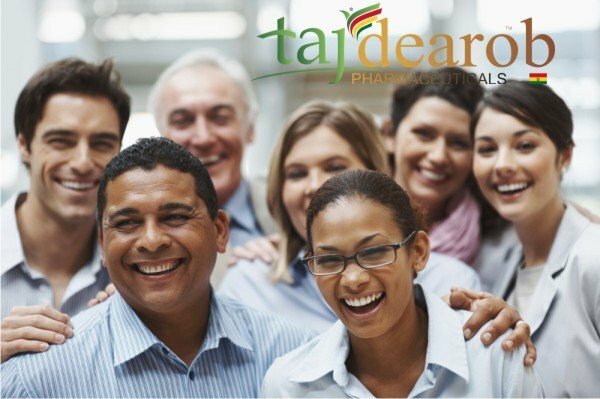 Our Board of Directors, which includes representation from both the Taj Pharma Group and Dearob Healthcare, understands how important it is to respond, not only to the demanding requirements of the pharmaceutical industry today, but also to the ever changing corporate compliance standards that must be met. At Taj Dearob Pharmaceuticals we apply our vast knowledge and experience to improve and deliver for our customers, a range of products and services to satisfy their medical needs at affordable prices. Corperate Team – Taj Dearob Pharma | Taj Dearob Pharma is an Ghana owned and operated International pharmaceutical company. We have evolved to become a leading pharmaceutical wholesaler and manufacturer of generic medicines, branded medicines, Active Pharmaceutical Ingredients (API’s) as well as Contract Manufacturing and Pharma Technology services. We also specialise in an extensive Oncology range with over forty different anti-cancer drugs and dosages in our portfolio.Corperate Team – Taj Dearob Pharma | Taj Dearob Pharma is an Ghana owned and operated International pharmaceutical company. We have evolved to become a leading pharmaceutical wholesaler and manufacturer of generic medicines, branded medicines, Active Pharmaceutical Ingredients (API’s) as well as Contract Manufacturing and Pharma Technology services. We also specialise in an extensive Oncology range with over forty different anti-cancer drugs and dosages in our portfolio.